Windows, especially those on the back side of a home, are one of the most common entry points for burglars. Securing the windows in your home with durable locks, including backup stops, can help prevent burglars who are looking for a quick entry. Here are a few things you can do to help make your windows more secure. If you have a wooden window frame, replace the window putty every few years and secure the wood molding with finishing nails (a slender nail that has a small head) at least 3 inches long. The strike plate is the metal plate that surrounds the lockset on a door. It’s set in the door jamb and receives the bolt of a lock, keeping the door in place. Because standard door moldings and deadbolt locks are rather easy for burglars to kick in, installing heavy-duty strike plates will help increase your home’s security. 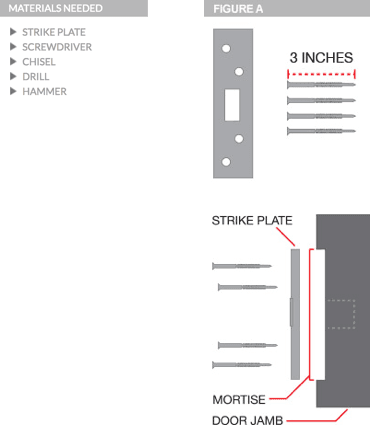 So here is an easy guide to installing heavy-duty strike plates and making your doors more secure. To install your new strike plate, mark the location where the plate will go. If a bolt hole does not already exist, close the door and mark where the hole should be drilled in the door jamb. 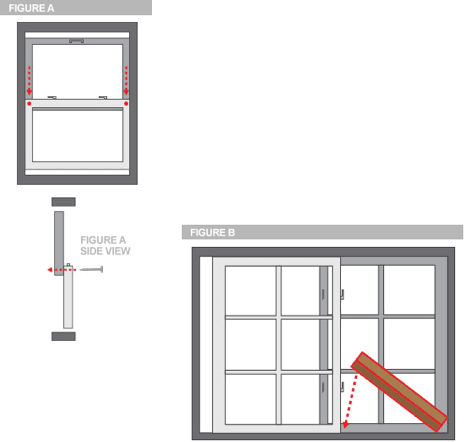 If you are simply upgrading your current strike plate a bolt hole should already exist, and you’ll only need to mark an outline where the new strike plate will be installed in the door jamb. When drilling a new bolt hole, use a drill bit that is as wide as the bolt and make sure the hole goes deep enough to receive the full length of the bolt, when the door is locked. Next, line up the new strike plate on the door jamb and create an outline where the mortise should be created. The mortise is the pocket that is cut into the jamb for the strike plate to fit into. Using a chisel, cut out the area you have marked, ensuring it is only as deep as the strike plate is thick. An easy way to clear out the area is to make your cuts 1/4 of an inch apart and remove the excess material using a downward scraping motion. Place the strike plate into the newly formed mortise, and screw it into the door jamb. Note: You may have to drill guide holes for the screws before securing the strike plate to the jamb to avoid any cracking or splitting of the door frame. Sliding glass doors are notoriously easy for burglars to break into, even when they’re locked. In fact, some burglars target homes with sliding glass doors because they’re easy to open. 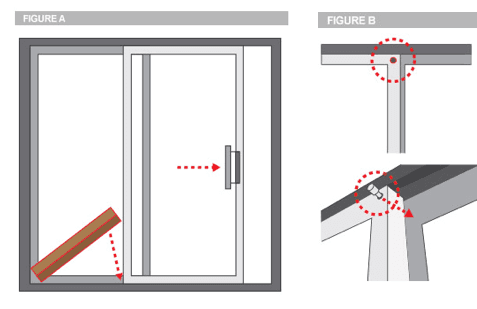 Use the following questions to help check the safety of your sliding glass doors. Are the door’s sliding rollers working properly or can the door be "jiggled" out of place? Even though the garage is one of the most common entry points for burglars, some homeowners fail to secure their garage properly. Follow these tips to help ensure your garage is as safe as possible. Every door attached to the garage should have a deadbolt and should remain locked at all times. Close your garage door quickly when you arrive home so you don’t reveal what you store in the garage. 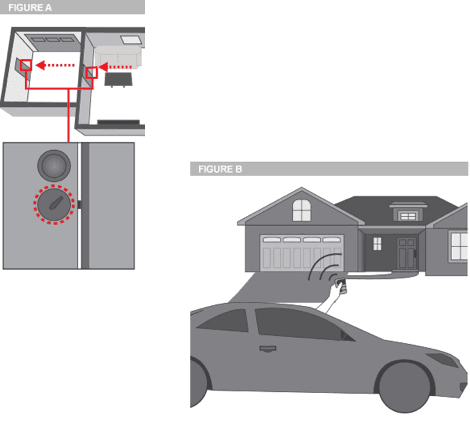 Electric garage door openers are usually equipped with an emergency release lever. This lever typically has a cord hanging down that allows you to open the door manually in case of an emergency or power outage. While these emergency release levers are convenient, a savvy intruder can slide a coat-hanger or other sturdy wire between the door and the frame, hook the emergency release lever and easily open the garage door. 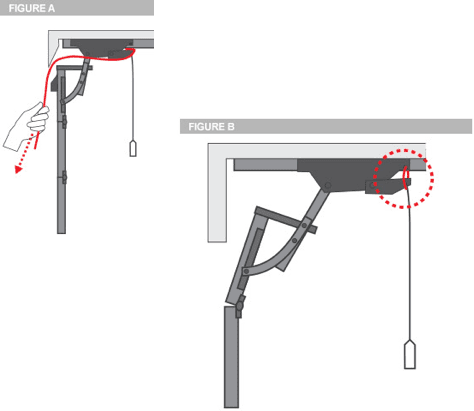 Here are a couple of things you can do to help prevent burglars from getting into your garage using the lever. When you get a security system, make sure to display the sign or the sticker that comes with the system on your front lawn or in your window. 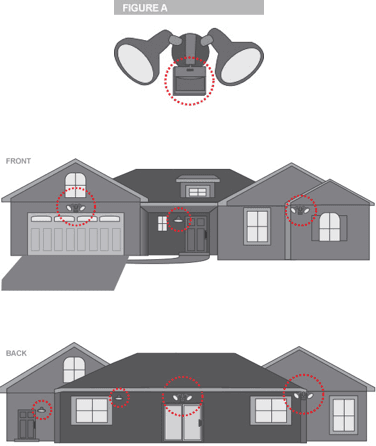 Seeing a sign indicating the home is protected by an alarm monitoring company can be all it takes to deter burglars. Also, a common place for burglars to enter the home is from the back yard so they’re not as likely to be seen. Having a sign or sticker on that side of the house can help discourage intruders. Ensure areas around windows, doors, and blind spots are properly lit, especially in the back of the home. When installing outdoor lights, make sure they are placed high enough that they can’t easily be disabled by an intruder. Avoid using solar-powered lights; a test completed by Consumer Reports concluded they’re too dim to provide adequate security. Compact fluorescent light bulbs are good options for outdoor lighting. They outlast other light bulbs and save energy. Call 1-855-699-5274 or complete the form for a free quote.